Why do we use Sequences and Transactions in UVM..? What is meant by a “Transaction”? What is the role/application of a “Transaction”? What is the relationship of a “Sequence” with the “Transactions”? The data members which stimulates the DUT ports. Pass the values to the DUT ports & receive the response values from the DUT ports. Some items which controls the temporal behavior & control the dependencies of these data members on each other to create required verification scenarios. These items we may call as the ‘control knobs’. Constraints applied on the data members & control knobs are also used to be part of a “Transactions”. These constraints act as the default constraints which anyways can be over-written, if required, by the in-line constraints defined during Sequence activation and Transaction randomization. Most of the data members & control knobs (declared using ‘rand’ or ‘randc’ type) are defined as of random in nature to apply the SystemVerilog randomization capability to the Testbench. Lets have a look at the example of a “Transaction”. Here, we can observe that a Transaction contains lots of information that is utilized by the constraint solver, randomization & mainly by the Driver to make the pin level activity to the DUT. Now after getting familiar with the “Transaction” or “sequence_item”, lets move to the “Sequence”. A “Sequence” in UVM is that dynamic object which is responsible to send the “Transactions” or “sequence_items” to the Driver & since its a dynamic object so it needs an static object/platform to support in the Sequence execution and that static object is called “Sequencer”. Hence, the communication between Sequence and Driver happens via Sequencer. Sequencer’s primary tasks are establishing the communication channels and implementing arbitration mechanism between Sequences & Driver, as shown in Figure 1 below. The flow of data objects is bidirectional, request items will typically be routed from the sequence to the driver and response items will be returned to the sequence from the driver, that is also shown in the Figure 1. To understand a “Sequence” in its simplest form – it’s a collection of “Transactions” or “Sequence_items”. Practically , a Sequence can trigger another Sequence or Sequences from with-in that depends upon the required verification scenarios or stimulus generation structure/stimulus generation flow. I’ll try to cover these complex Sequence structures and handling in my upcoming posts. The following code will make it clear – how a sequence i.e. “my_seq” transmit a transaction of type “my_txn” “N” number of times, one transaction after another. Body() task – uvm_sequence contains a task called body(). It is the content of the body() method which determines what a Sequence actually does. Sequencer on which the sequence is running. The m_sequencer handle can be used to access configuration information and other resources in the UVM component hierarchy. 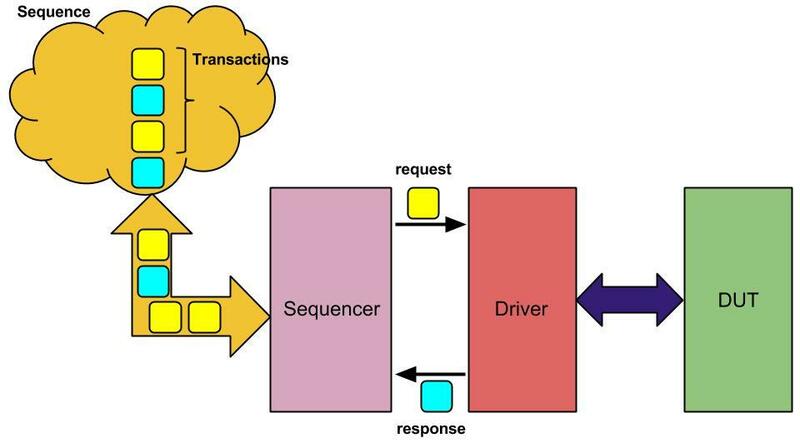 How a Sequencer communicates with a Driver to transmit the Transactions (Sequence)? is shown in one of my previous post called “UVM Driver and Sequencer Communication“. Please refer this post to get familiar with this process. Till now, we saw – the structure of a Transaction, the structure of a Sequence, relationship between Sequence and Transaction or sequence_items, how to send a sequence_items to the Driver via the Sequencer. In addition, Its highly important to understand – How to start a Sequence? A Sequence is started using its start() method. The argument passed to the start() method is the Sequencer pointer of the Sequencer on which we want to run this Sequence. How all it happens internally is this – the start() method assigns the passed Sequencer pointer to the Sequencer handle which is called “m_sequencer” within the Sequence & then calls the body() task within the Sequence. When the sequence body() task completes, the start() method returns. Since it requires the body() task to finish and this requires interaction with a driver, start() is a blocking method. To summarize this blog, what we came across to know is all about – Transactions, Sequences, important properties of Transaction & Sequence, relationship between Transaction & Sequence and finally how to start a Sequence on a Sequencer. I believe, this effort will help you to get a fair information about the topic. I’ll try to put down additional Sequence topics very soon. I hope you enjoyed this blog. Thank you for your time.